Elation Professional has launched its new Lumina Matrix LED Wash/Blinder, offering DJs a professional warm-white wash and pixel-mappable blinder solution for use on large-scale mobile lighting rigs. 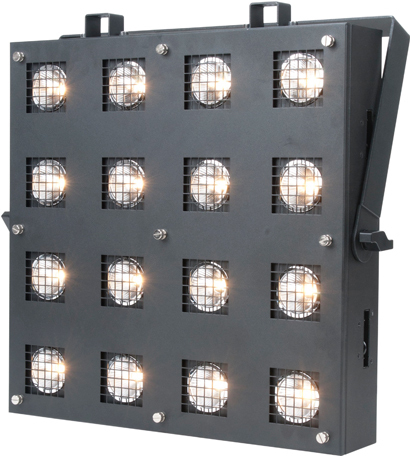 Using sixteen 7W LEDs in a four-by-four arrangement, with a 15-degree beam angle, the Lumina Matrix features a perfectly-aligned reflector to mimic the warm look of tungsten halogen lamps. Two operational modes, Program Mode and DMX Mode, allow DJs to operate the fixture using pre-programmed effects or with more precision using DMX. The fixtures can be rigged side by side, in a vertical or horizontal array, in order to achieve wider-reaching effects and for bigger venue and dance-floor sizes. Connecting more than one Lumina Matrix as part of a larger lighting rig is possible due to professional powerCON in/out connections, which offer reliability and safety when it comes to power linking the multiple fixtures. The units can be hung and mounted in a variety of ways, due to multiple rigging options, and an integrated mounting yoke, with tilt adjustment, allows the fixture to produce white-wash effects at any angle. With theatrical grade 0-100% electronic dimming and variable dimming curves, DJs can make easy adjustments to light intensity, and individual control over each pixel allows custom designs to be made. Furthermore, convenient built-in chase macros offer preset patterns and, with variable speed and fade control, allow for a range of chase effects. An LCD display with a four button control panel allows users to adjust DMX addressing, giving them control over operational modes and the 16-bit electronic dimming, as well as the individual pixels. DJs also have access to software updates, which can be made remotely through RDM. The Lumina Matrix’s warm wash effects make it particularly suitable for washing dance-floors and audiences and it draws a low 150W of power; meaning mobile DJs can run the fixture from a standard power source as part of their mobile setup. The use of LEDs also makes the fixture low maintenance and offers increased energy efficiency.